Does my patient need blood? 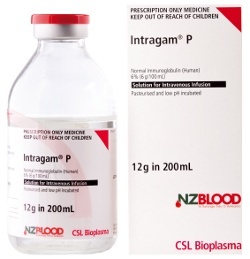 Intragam®P is a 6% solution of human immunoglobulin (antibodies) (6g/100mL) prepared from pooled plasma donations made from New Zealand donors for intravenous use. It is intended only for long term use when provided from NZBS-managed blood banks. This is explained in a letter from NZBS's National Medical Director and in the October Blood Issues newsletter. For intravenous immunoglobulin for short term use provided from NZBS-managed blood banks, please see Privigen®. For subcutaneous immunoglobulin, please see Evogam®. For a list of all immunoglobulin products, please see here. 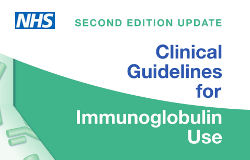 Because intravenous immunoglobulin is an expensive medication with increasing demand, pre-approval of new patients receiving intravenous immunoglobulin is required. Please see the guidelines provided on the right and complete the pre-approval form, also on the right. If urgent, please contact the Transfusion Medicine Specialist on call. Compatibility is not relevant for manufactured (fractionated) plasma product transfusion, however see Precautions below for risk of haemolysis in group A patients. Infuse once the bottles have reached room temperature. If there is a delay, return to Blood Bank, or store at 2-8°C in a blood bank approved vaccine or blood refrigerator. Do not refrigerate after the bottles have reached room temperature. During storage protect the bottles from light. Multiple bottles of the same batch may be pooled together. Use a vented infusion set or a standard infusion set with a venting spike. A filter is not needed. Glucometers: Intragam®P contains maltose. Maltose is detected by some glucometers causing the machine to falsely report a high glucose (see manufacturer's instructions). Hydration: Ensure your patient is adequately hydrated as patients with pre-existing renal impairement, diabetes mellitus, volume depletion, sepsis, paraproteinaemia, or those taking concomitant nephrotoxic drugs or who are more than 65 years old are at risk of acute renal failure. Renal function should be monitored in these patients. Patients with Group A red cells should be monitored for haemolysis (see manufacturer's instructions) as Intragam®P contains anti-A and anrti-B antibodies. Passive Transfer of Antibodies and Interference with Serological Testing: After injection of immunoglobulin, the transitory rise of the various passively transferred antibodies in the patient's blood may result in misleading positive results in serological testing. Inactivated vaccines (e.g. flu, hepatitis B, tetanus, pneumococcal): Inactivated vaccines may be administered concurrently with passive antibody to induce active immunity. Live attenuated virus vaccines (e.g. meales, mumps, polio, rubella): Passively acquired antibody can interfere with the response to live, attenuated virus vaccines. Administration of such vaccines should be deferred until approximately three months after passive immunisation. If immunoglobulin is administered within two weeks of vaccination with a live attenuated virus vaccine, the efficacy of the vaccine may be compromised. Consideration should be given to re-vaccination approximately three months after the immunoglobulin was given. Adults: start infusion slowly (1mL/min) for first 15 minutes, then increase gradually to a maximum of 3-4mL per minute over further 15 minutes. Paediatric patients: start at 1mL/kg/hr (or 0.5mL/kg/hr for first infusion) for the first 15min and the rate then doubled every 15 minutes up to a maximum rate of 5mL/kg/hour. See also the Starship Hospital Clinical Guideline. Slower infusion rates will diminish rate related symptoms such as headache, shivering, tachycardia and BP alterations. Electromechanical pumps are recommended for infusion. There is no need to slow the infusion down if changing between bottles of different batch numbers of Intragam®P. under 15 kg should only receive the 3g bottle size. weighing 15 kg or more can receive the 3g or 12g bottle sizes. Reactions tend to be related to the infusion rate (i.e. faster rate = more severe reaction) and are most likely to occur during the first hour of the infusion. DO NOT add medications to blood products. Intragam®P is hyperosmolar. If this is a problem (e.g. neonates), Intragam®P may be infused diluted with up to 2 parts of 0.9% saline or 5% glucose. Replacement therapy (for immunodeficiency): adjusted for the individual patient. Typically 0.2 - 0.6 grams Intragam®P per kg bodyweight per month. Higher doses may be needed initially following diagnosis (0.4-0.6 g/kg). ITP: optimal dose determined for each patient. May receive a total cumulative dose of 2 grams Intragam®P per kg bodyweight over 2-5 days. Kawasaki's Disease: 1.6 - 2 grams Intragam®P per kg bodyweight divided over 2-5 days or 2 grams per kg as a single dose. Guillain Barre Syndrome: 0.4 grams Intragam®P per kg bodyweight per day over 3-7 days. Allogeneic bone marrow transplantation: 0.5 grams Intragam®P per kg bodyweight per week. This calculator will calculate the number of 12g and 3g bottles you need as well as the rates and time taken to infuse it.